Algae seems to multiply by the day. Once a pond has the green stringy, seaweed looking slimy stuff it keeps growing until you have a very large problem in your pond or lake. We are often asked about algae especially as the temperature rises and summer is upon us. Algae needs sunlight and food to grow. Both of which are abundant at this time of the year. To make things worse for the pond when treated with chemicals the dead algae builds up on the bottom of the pond which is actually a food source for the growing algae. To battle algae we recommend a proactive approach. Purchasing a floating pond aerator for your pond will save you a lot of time as it is easy to install and it circulates the water. Debris that has accumulated in the lake or pond can now start to break down because of the added oxygen and doesn’t become a food source for algae. Aeration also adds oxygen back into the water to help beneficial bacteria continue to grow and breakdown the nitrates in the water. This in turn helps your water improve naturally. A pond Aerator should be built to last and have a closed cell foam core for durability and sound reduction. Consider models that have motors and mounts that are made with stainless steel for minimal maintenance and durability. Submersible power cables should be a hybrid cable with non wicking fillers in case the outer shell is ever cut. When making a purchase decision safety is very important with electric power in the water. Insist on models that have been tested and approved to UL and CSA standards. 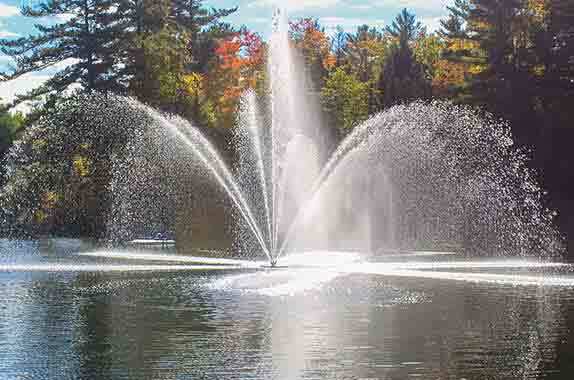 Arbrux Limited has been in business since 1979 and proudly makes all of its pond aerators in Canada.